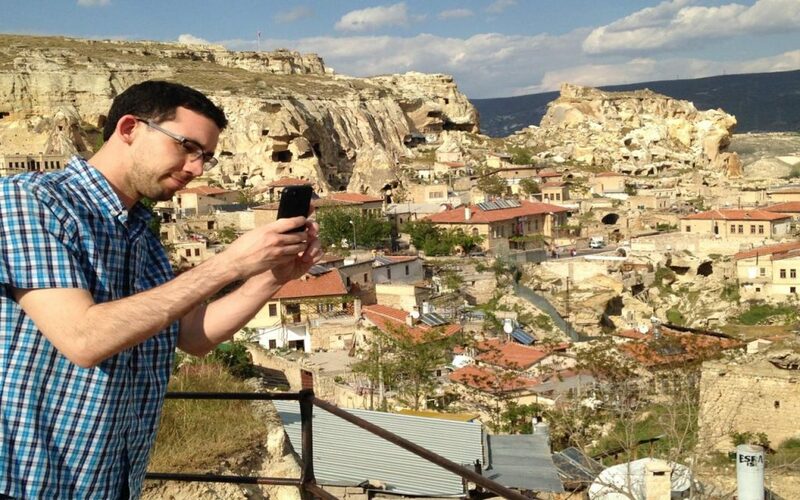 The Flintstones would feel right at home in Ürgüp, a little town built among the iconic cliffs, boulders and bizarre rock formations of central Turkey’s Cappadocia region, a tourist magnet. For centuries, people made homes and churches in caves carved out of the soft volcanic rock. In Ürgüp and throughout Cappadocia, you see rock-cut holes, doors and windows everywhere—reminders of past civilizations. Yet some of these hollowed-out spaces are still inhabited by local residents, and many tourists don’t consider a Cappadocia trip complete without staying in one of the new cave hotels, which have become attractions in themselves. 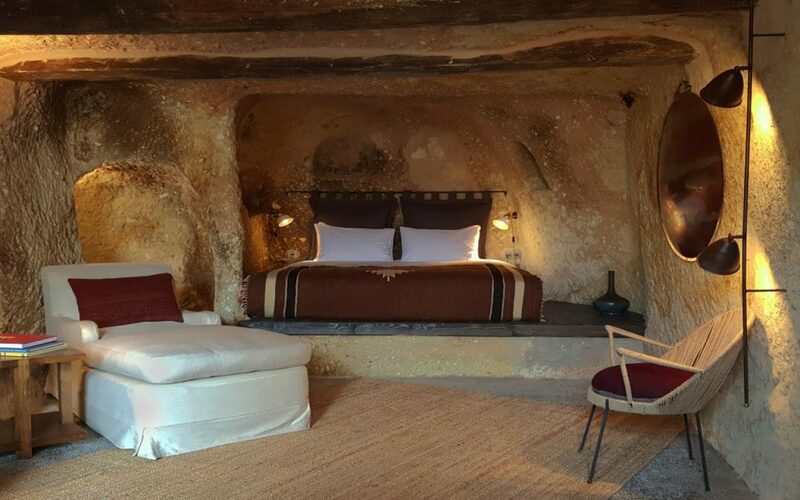 Each guest room at Sota Cappadocia cave hotel has its own patio. These quirky, stylish, contemporary hostelries offer amenities that Fred and Wilma Flintstone could never have imagined. We stayed two nights in a boutique cave hotel called Sota Cappadocia (www.sotacappadocia.com) and found it to be a far cry from living the life of a caveman. Hotel manager Nil Tuncer and her co-owner bought the property in 2010 from a family that called it home. To preserve the structure’s historical integrity, plans for the restoration had to be submitted to Turkey’s Cultural Ministry. The construction project took five years. Sota Cappadocia’s seven guest rooms provide top-of-the-line amenities. 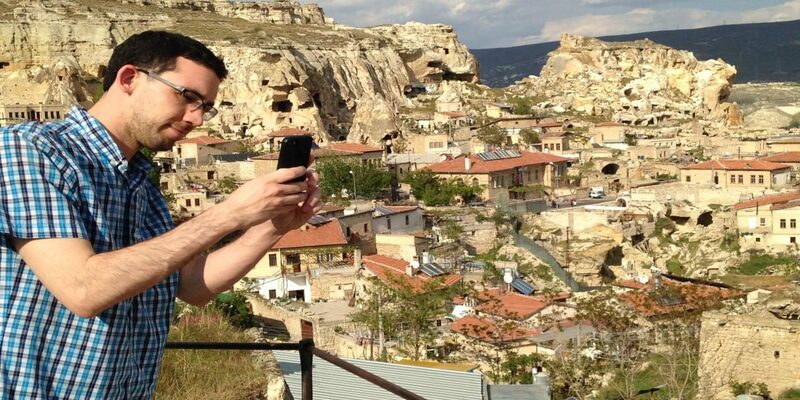 Originally from the Turkish sector of Cyprus, Nil speaks excellent English and worked in technology for the National Cash Register Company in Istanbul before changing course and moving to Cappadocia to get into the hospitality business. 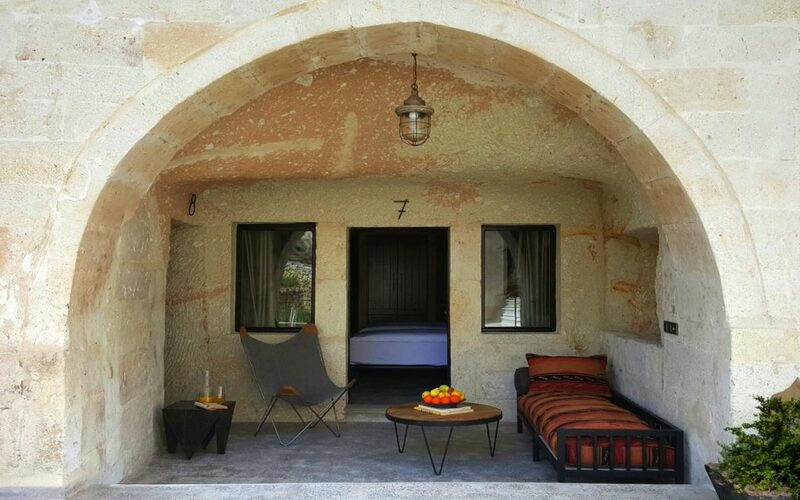 Sota Cappadocia’s seven guest quarters are open now, with three more in the works. The rooms had been lived in for hundreds of years. One was used for a wine press that made pekmez (grape molasses), a condiment and cure-all in Cappadocia and one of the many delicious spreads served at the hotel’s bountiful breakfast. Another room was the kitchen/dining area. Our twin room was once a knitting/weaving room where women made kilims and carpets, including those woven for young girls’ wedding dowries. Other units were the grandparents’ bedroom and a food storage room. 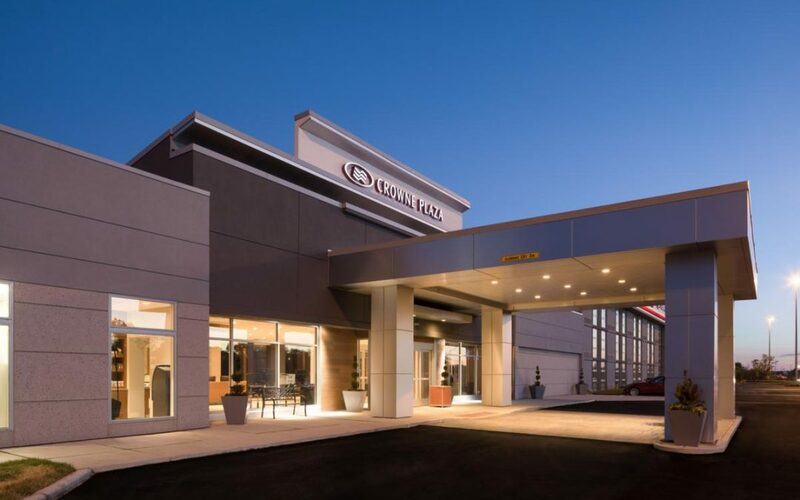 Guests of the multi-level, cliff-clinging hotel enjoy modern plumbing and bathroom amenities typical of an upscale hotel. Our bath facilities were divided into two spaces with a closet in between. On one side was a big shower with olive-green tiling and oversized showerhead, on the other the toilet and sink. In some rooms all bath facilities are combined. The rooftop terrace of Sota Cappadocia cave hotel overlooks Ürgüp, a tourist-friendly town built among a jumble of cliffs and boulders in the Cappadocia region of central Turkey. We found our room cozy and charming but not musty or claustrophobic. A few areas of the grayish rock walls and ceiling were streaked with natural iron deposits. The desk and shelf occupied carved-out niches. 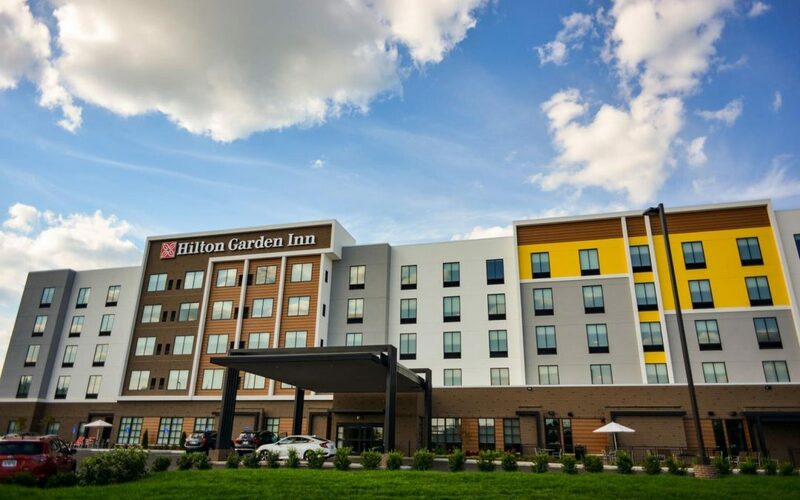 There are plenty of electrical outlets, and the hotel offers free Wi-Fi access. Bedrooms and baths have under-floor heating. Each guest room has a patio with chairs or cushions covering a rock or wooden bench. The rate for two, including breakfast, is 100 to 150 euros ($118 to $177). Breakfast at Sota Cappadocia is monumental. It starts with a huge omelette with your choice of ingredients—I liked the salami with yellow cheese. Our meal also included a plate with six cheeses, two cold cuts, dried apricots and walnuts. In addition, there were four varieties of bread, including simits, the sesame seeded-encrusted rings sold in pushcarts everywhere. For spreads, we could choose from three homemade jams (fig, strawberry, orange) and honey oozing right out of the honeycomb—each served in its own cocktail-type glass. Or we could dip our breads in olive oil, olive tapenade or grape molasses; the latter was good mixed with tahini. Red peppers, olives, greens, and sliced cucumbers and tomatoes completed the smorgasbord. One day all this food was placed on our table, the next day served buffet-style in the adjacent bar. 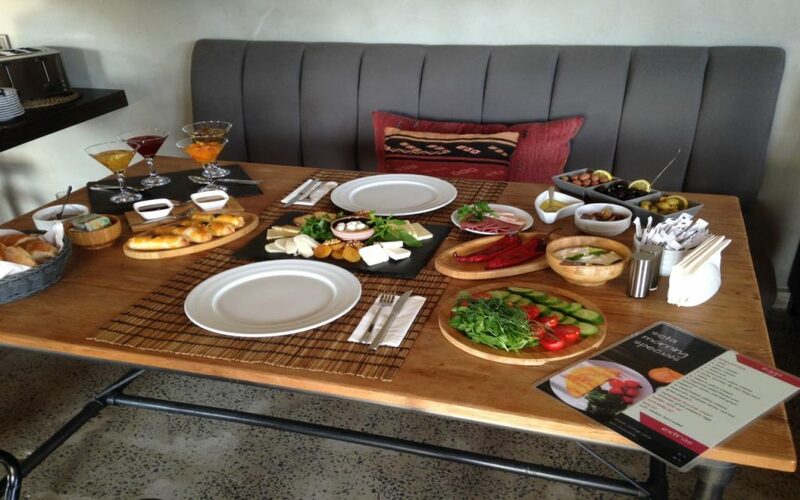 Breakfast is a treat at Sota Cappadocia cave hotel. The homey breakfast area, with fireplace and beamed ceiling, is the lounge between the bar/kitchen and rooftop terrace, a heavenly spot with four sun beds. Before breakfast and after a busy day of sightseeing, we enjoyed winding down on this lofty perch and looking out over the town with its jumble of odd rock formations pocked by openings that once served as doors and windows. The lounge has a 24-hour, self-service bar, which means guests can help themselves to drinks at their leisure. And the staff will gladly serve you tea and snacks upon your return from sightseeing—or anytime. Nil greeted us at breakfast every morning and was eager to arrange tours of the area. She recommended that a private driver take us to the top tourist sights, explaining that we wouldn’t be satisfied with a commercial tour. So, both days we traveled around in a yellow taxi driven by a young man named Mustafa, paying him $75 to $85 for the day. He took us to places like Goreme Open-air Museum, famous for its collection of ancient cave churches, and Derinkuyu, the most extensive of Cappadocia’s underground cities discovered to date. Before we hit the road, Nil listed the places we would see and showed our route on the map. She even arranged restaurant meals in other towns. The personal attention we got from Nil—and from her colleague, Cemal, was much appreciated. 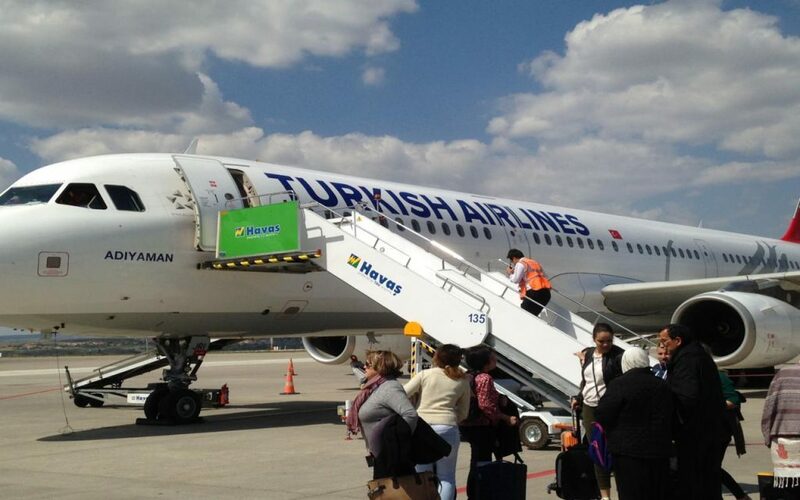 Turkish Airlines serves Nevsehir’s airport with flights from Istanbul and other cities in Turkey. The hotel also reserved the 45-minute shuttle bus ride from Nevsehir Kapadokiya Airport, where our Turkish Airlines flight from Istanbul landed mid-afternoon. 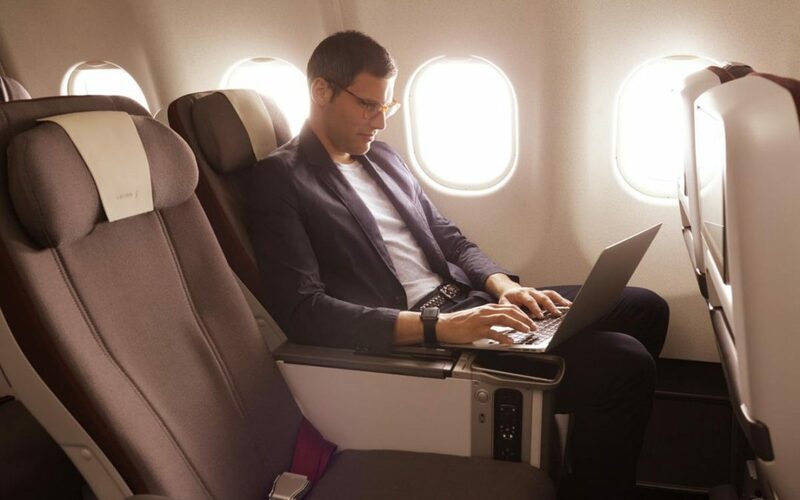 The airline has three flights daily from Istanbul to Neveshir, and flight time is only an hour and 15 minutes. Our roundtrip—for two—was an unbelievably low $97. Ürgüp has many shops, restaurants, money exchanges and banks, plus travel agencies that book tours and hot-air balloon flights over the surreal volcanic landscapes. One enterprise is called Flintstones Travel Agency. Nil recommended Ziggy’s Cafe (www.ziggycafe.com) for dinner one night. From the hotel we walked two or three blocks and found the restaurant to be a restored stone house built into a mountainside with open-air terraces on three levels, much like the layout of Sota Cappadocia. From an outdoor table as the sun set over the rocks of Ürgüp, we savored a fine meal with Cappadocian wine that set us back only $26 for two. Sporting a contemporary tone yet reflecting the character of ancient Cappadocia, Ziggy is known for the small bites on its meze (appetizer) tasting menu, but we went for main courses. Our choices were the cheese borek (a classic Turkish dish made with thin flaky layers of phyllo dough) and noodles in Cappadocian-style pastirma (sun-dried spicy beef) sauce. Other entrees included garlic chicken grilled on skewers and steak with pumpkin-seed sauce and bulgur (cracked wheat). Also tempting was the Sweet Ziggy dessert—a plate of miniature boreks with cinnamon and powdered sugar. Ürgüp makes a great base of operations for exploring Cappadocia, and Sota Cappadocia is a nice place to rest your head—and have the breakfast of your life.